Rows 1, 3, 5, 7 - RS: Color A, k2, * sl 5 wyif, k5; rep from * to last 7 sts, sl 5 wyif, k2. Rows 2, 4, 6, 8: Color A, purl. Row 9: Color B, k4, * k1 uls, k9; rep from * to last 5 sts, k1 uls, k4. Row 10: Color B, purl. Rows 11, 13, 15, 17: Color B, k7, * sl 5 wyif, k5; rep from * to last 2 sts, k2. Rows 12, 14, 16, 18: Color B, purl. Row 19: Color A, k9, * k1 uls, k9; rep from * to end. Row 20: Color A, purl. K1 uls: Knit 1 under loose strands. 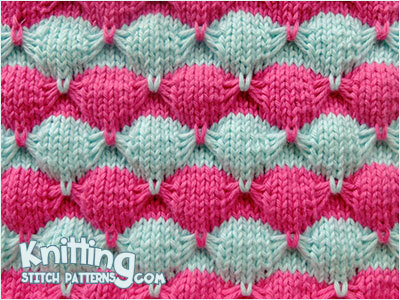 Insert RH needle through the 4 strands from below, then knit next stitch bringing the knit stitch through the loops.